A modest but bubbly comedy of manners. 116 min. Paramount. Director: Donald Petrie. Cast: Kate Hudson, Matthew McConaughey, Michael Michele, Thomas Lennon, Annie Parisse. 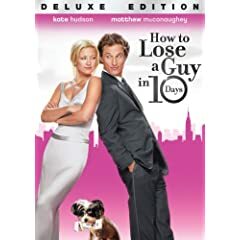 A modest but bubbly comedy of manners, How to Lose a Guy in 10 Days runs with a cockeyed but clever cross-purposes premise too gratifying to damn with anything other than faint praise. The romantic comedy formula remains rigid, but with likeable stars such as Kate Hudson and Matthew McConaughey and sturdy direction from the likes of Donald Petrie, the old ways can be good ways. Hudson plays Andie Anderson, an overqualified columnist for Composure, a glossy, superficial woman's magazine. Dubbed the "how to" girl, she longs to be a political writer, and is oddly surprised when her editor (an amusingly aloof Bebe Neuwirth) continues to hold her down. McConaughey plays Ben Barry, a rather generic movie "man's man" (motorcycle, check; sports fan, check; upwardly mobile job at an advertising firm, check; cigars and poker, check and check). Andie suggests an article about all of the things which drive guys away, a sort-of "how not to" article about girls who are "clingy, needy, touchy-feely." A series of convolutions finds her paired with Ben, whom she proceeds to try to drive away by a battery of creative tortures. Why does Ben continue to put up with them? Because he's made a bet (for a lucrative diamond account) that he can make a girl fall in love with him in ten days! Add Robert Klein and stir. Let sit for two hours to harden. Once you ride out the exposition, you're liable to settle in for a fairly funny and ultimately sweet ride. The two schemers meet cute at a bar (She: "True or false: all's fair in love and war." He: "True." She: "Good answer." He: "Good question."). What follows is a painful endurance test for Ben; his claustrophobia is palpable as Andie forces him to sacrifice himself, embarrasses him, humiliates him, crowds him, and scares him. She ruins more than one Knicks game for him, redecorates his apartment, makes a Photoshop album of their future family, and he grits his teeth for more. McConaughey's comic incredulity and ire suit the role well, and an effervescent Hudson agreeably plays two faces: one a hellishly annoying whirling dervish and the other smart, lovely, and vulnerable. As her desperation to "lose" him crescendos, you may begin to picture Hudson going for a Misery scenario involving a sledgehammer, but that never comes to pass. Instead, the inevitable "big social event" comes around, where lies are climactically revealed to apocalyptic romantic ruin, resolved in a boy-chases-girl coda. Based on the Rules style dating book of the same (by Michele Alexander and Jeannie Long), How to Lose a Guy in 10 Days coasts on he-she chic and gender-foible schtick. The women's faux dating self-destructiveness counterbalances with unlikely male audacity to create funhouse-mirror lessons unlikely to be of use to most. In the end, the clearest message is: don't lie to a "keeper." 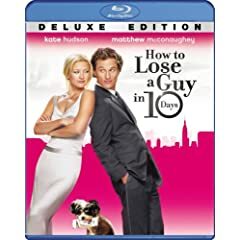 Paramount's Deluxe Edition of How to Lose a Guy in 10 Days comes to Blu-ray and DVD with a hi-def transfer that easily bests any previous home-video edition. Film-like in appearance, the transfer accurately represents the movie's original look: the appearance can be a bit soft at times, due to diffused lighting, but it's part and parcel of the cinematographic approach, and detail and texture lack nothing. Color, contrast and black level all earn high marks for a very pleasing presentation. This six-year-old comedy doesn't offer much opportunity to show off its audio, but the which leads to a merely average Dolby TrueHD 5.1 mix, but one that's certainly more than adequate for this material. The commentary by director Donald Petrie provides an opportunity to get to know one of Hollywood's quiet craftsmen, a guy who's been plugging away at studio product for years without drawing any hype. Not surprisingly, his personality doesn't set the world on fire, but he does a good job of covering the bases about the film in its initiation, production, story and characters. "How to Make a Movie in 2 Years" (16:53, HD) is an intriguing new featurette exploring the picture's origins, casting, and shooting with the book's authors Michele Alexander & Jeannie Long, producer Christine Peters, producer Linda Obst, and director of photography John Bailey. In "Why the Sexes Battle" (5:00, HD), evolutionary expert Shanee Edwards, psychologist & author Dr. Aaron Kipnis analyze the film and the characters in gender terms. Though short, this featurette doesn't disappoint, and it would be nice to see the studios support this type of academic-skewing bonus more often. "Girls Night Out" (5:15, HD) returns to Alexander & Long for some frank talk—from two female perspectives—Tabout the dating world. Last up are the "Music Video 'Somebody Like You' by Keith Urban" (3:53, SD) and five "Deleted Scenes" (9:30, SD) with optional commentary by Petrie. All site content © 2000-2019 Peter Canavese. Page generated at 04/18/2019 12:43:32PM.